Peter Bryer: Mobile Foresight: ZTE Nubia Z5. A super-thin, quad-core, 1080p superphone. Time to catch some Z's. 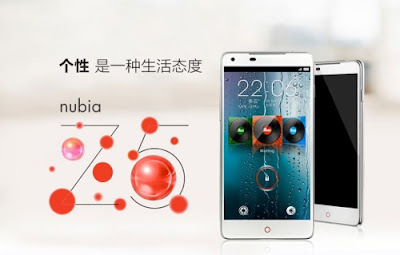 ZTE Nubia Z5. A super-thin, quad-core, 1080p superphone. Time to catch some Z's. ZTE recently established the "Nubia" sub-brand to stamp on its higher-end devices in order to make a serious push against competitors such as Samsung, Apple, LG, Nokia, and HTC. Will it work? This latest device does look serious. The ZTE Nubia Z5 runs Android Jelly Bean on a Qualcomm 1.5GHz quad-core chipset, has a 5-inch 1080p display with 443ppi, 32GB of internal memory, a 13-megapix camera with a Konica Minolta branded lens, a 2-megapix front-facing camera, and 2GB of RAM. All this comes in at 126 grams with a thickness of 7.6mm. The unsubsidized retail price for a Chinese-specific version is $550 which is a good value for such a super smartphone. So, will Nubia phones like this soon be on sale at your local Carrefour or Walmart or via key operators? I think it's safe to say that you will soon be able to catch some Z's at a retailer near you.